Visual Voices is a show of Zenith artists – Past, Present & Future - profiled in the new book “100 Artists of the Mid-Atlantic” by Ashley Rooney. Margery E. Goldberg has been a major player in the Washington arts community for three decades as an entrepreneur, owner of Zenith Gallery, curator, wood sculptor and activist, and in this show she shines a spotlight on artists with whom she has worked and collaborated over the years. 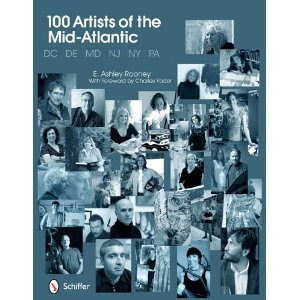 All have recently been recognized for their talents, in a new book by Ashley Rooney, “100 Artists of the Mid-Atlantic". The show at Zenith Gallery will open with a Book-signing Party with the author and artists, on Wednesday, September 21, 6:00 – 8:30pm, and remain on display through October 29, 2011. In “100 Artists of the Mid-Atlantic,” Ashley Rooney highlights more than 480 paintings, sculptures, photos, drawings and statements by 100 contemporary artists working in oil, glass, multi-media metal and other materials. Rooney has written many books on architecture, design and art in recent years, including “100 New England Artists in 2010.” She turned to writing after years in management consulting and working with adolescents. “100 Artists of the Mid-Atlantic, $45, will be available at Zenith Gallery throughout the exhibition. Now in its 33rd year, Zenith Gallery provides high-quality acquisition, consulting and commissioning services to residential/corporate clients via its website, a salon gallery just off 16th Street, by appointment and house calls. In addition to curating shows throughout Chevy Chase Pavilion, where Zenith also operates a gallery on level 2, Zenith curates rotating exhibitions at the Eleven Eleven Sculpture Space at 1111 Pennsylvania Avenue. Artists: Alan Binstock, Joan Danziger, Julie Girardini, Margery E. Goldberg, Robert C. Jackson, Michael Janis, Joan Konkel, Anne Marchand, Donna McCullough, Davis Morton, Carol Newmyer, Marc Rubin, Barton Rubenstein, Sica, Ellen Sinel, Betsy Stewart, Cassie Taggert, Tim Tate, Erwin Timmers, Paul Martin Wolff, Joyce Zipperer and yours truly. Zenith’s gallery, on level 2 next to Embassy Suites Hotel, is open Wednesday-Saturday, noon-6:00 PM and by appointment.